WILTON, Conn. -- Chefs Bill Taibe of Westport, Tim LaBant of Wilton and Jacques Pépin of Madison were taped cooking up a storm -- literally -- at Wilton's Millstone Farm on the newest episode of the PBS show, "Moveable Feast with Fine Cooking," which will be broadcast at 3:30 p.m. Sunday. 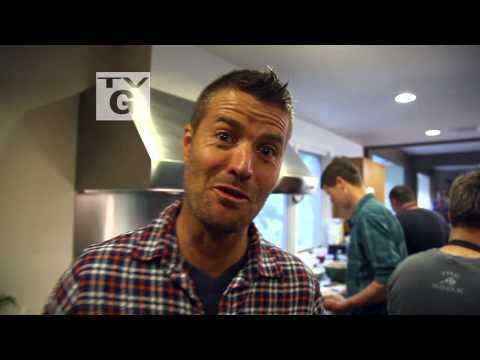 Hosted by award-winning Australian chef Pete Evans, the show challenges chefs across America to create a meal for a large group of people in a limited amount of time while using only fresh, local ingredients. The series is produced by WGBH-TV Boston and Newtown-based "Fine Cooking" magazine, published by Taunton Press. Taibe is the chef at leFarm and Whelk in Westport. LaBant is the founder of the Schoolhouse Restaurant in Cannondale. Pépin is a legendary French chef, who Julia Child once called "the best chef in America" and has hosted dozens of cooking shows on PBS. In the episode, the chefs prepare a baby carrot salad, fennel-Parmesan fritters with greens in a buttermilk-bacon dressing, slow-roasted pork shoulder with salsa verde, scrambled eggs with tomatoes and herbs, and strawberry and honey buckle with marsala ice cream, all while Tropical Storm Andrea rages outside. Click here for more information on the episode and on the show .